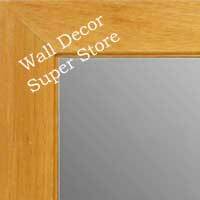 Custom Mirrors With Light Wood Finish - Very Light Soft - To Darker Natural Colors - Personalize A Lighter Wood Framed Mirror In Any Size To Match Your Decor. Add An Optional Bevel. 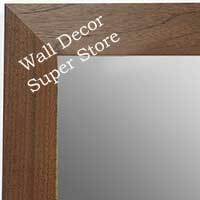 Custom Mirrors With Medium To Darker Wood Finish Frames - Fabricated To Your Exact Size - Match Your Decor - Very Large And Very Small Decorative Mirrors Using Medium To Dark Wood Tones. Custom Mirrors With Dark Wood Finish Frames - Create A Mirror With A Dark Wood Tone in Any Size To Match Your Decor. 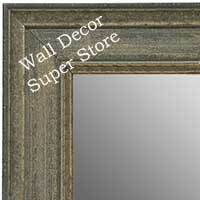 Very Large And Very Small Mirrors Darker Wood Tone Finish. Custom Mirrors With A Cherry Or Mahogany Finish. Great Selection Of Lighter To Darker Red Wood Tones - Create A Mirror To Coordinate With Any Cherry - Mahogany Decor. Custom Mirrors With Maple Finish - Honey Maple - Light Natural Maple - Classic Style Mirrors With A Warm Maple Finish - Perfect For Any Room. Custom Mirrors With A Classic Oak Look - Traditional Oak Grain - Choose A Traditional Flat Or Beveled Premium Clear Mirror - Very Large And Very Small Oak Mirrors Can Be Made With These Frames. 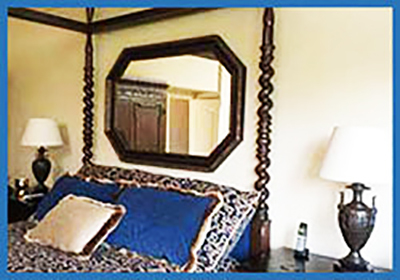 Custom Mirrors Made With Pecan Finish Frames - Create A Special Size To Fit Your Space. Guaranteed Safe Delivery Anywhere In The USA. Pine Mirrors - Great For That Comfortable Look - Different Colors Of Finish - Use In Any Room And Make In Any Size. 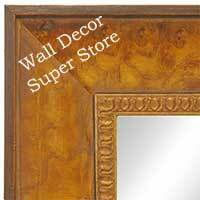 Great Assortment Of Custom Mirrors With Walnut Frames - Wide And Narrow Styles - Flat Profile and Very Ornate Detail. Budget Priced And More Expensive Options - Custom Make To Your Size. 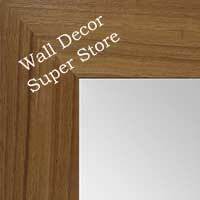 Custom Wood Finish Mirrors With A Decorative Flair - Add That Extra Touch To The Decor With This Assortment Of Frames. Very Large And Very Small Mirrors Can Be Made With These Styles. Assorted Wood Finish Custom Mirrors With A Little Different Look - Interesting Coloration Or Style - Find An Unusual Mirror For That Special Wall - Custom Make Any Size. Assorted Mirrors Made With Wood Finish Frames - Browse Through Walnut, Cherry, Mahogany, Maple, Oak And More. Flat Profile, Textured, Distressed Finish And More - Make In Any Size. Custom Espresso Wall, Floor, Bathroom Mirrors - Any Size. 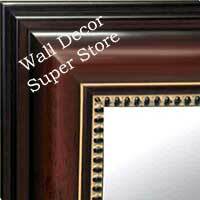 Select From A Wonderful Assortment Of Medium To Dark Brown Framed Custom Mirrors. Add An Optional Bevel.